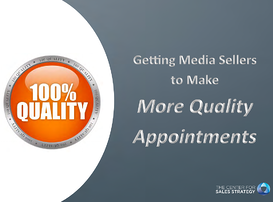 Get 15-20 Quality Sales Appointments a Week! The old approach to sales that we all know so well hasn't been working as effectively for some time now, and it's time to make a change to your sales process. In this eBook, learn seven powerful ideas you can use to be part of the salesforce of the future! Keep track of quality appointments. Hire someone to make calls. Hire assistants to do non-critical sales work. Get all the details when you download this eBook, designed to help media sellers increase the number of quality calls they go on each week. Download your copy today by completing the form to the right.